A simple to use, survey library for collecting feedback from your users. 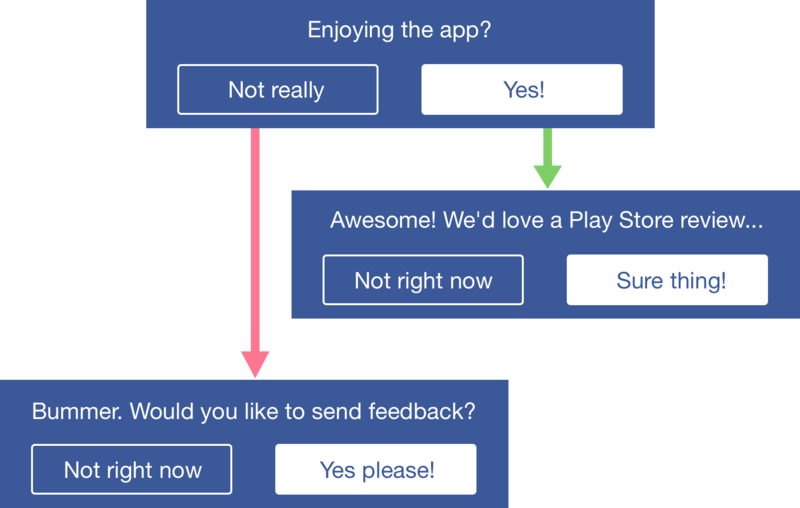 Respectfully request feedback in your Android app. Maoni is a lightweight open-source library for integrating a way to collect user feedbacks from within Android Applications. A powerful and simple library to open issues on GitHub directly from your app. An Interactive Feedback Dialog for Android inspired from Google Maps Review section. Easily gather feedback from any android application. Get detailed information on the email. RatingRequest library is a simple android dialog for request rating and review. Android library to create and manage simple rating views with stars. An android library to display a rate dialog in an easy way. Its a library to add customer-support module to any android app. Its fully built on firebase and easy to integrate. It also has inbuilt admin section to monitor and resolve tickets raised. This is a very small library that allows you to send feedback from an app without internet connection via email, either directly or via an unintrusive notification.